I got out for a quick look at some wildflowers at Anza-Borrego Desert State Park on Sunday morning. I got out there at 6am just as the sun was rising, and by 8am the light had grown so harsh I put my camera away and just hiked around. The bloom is definitely on and will be going for a few weeks I think. My guess is that it will be good but not great, at least not surpassing the bloom of a few (was it three?) springs ago, but at least it is better than the poor showings we had the last two years. One thing I noticed was a huge abundance of desert lilies. In one area I hiked, I had a hard time finding a place to step without smashing small desert lilies, they were everywhere. 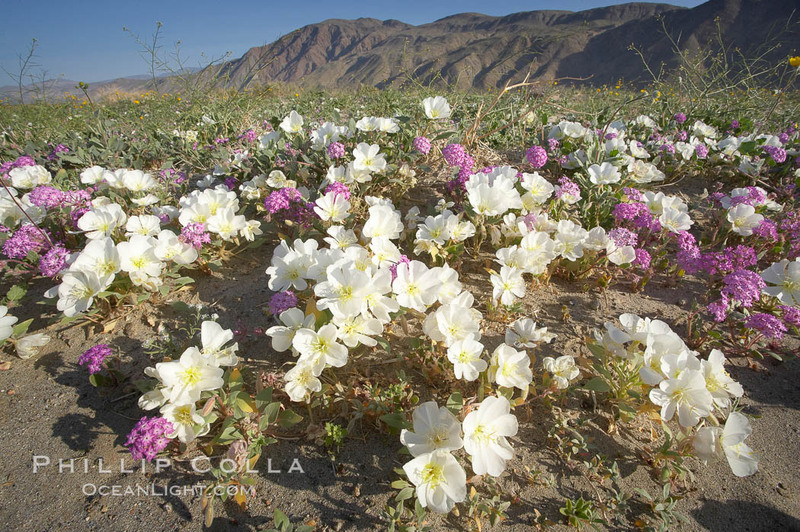 The cluster shown here, composed of white dune evening primrose and purple sand verbena, is literally inches from Henderson Canyon Road.